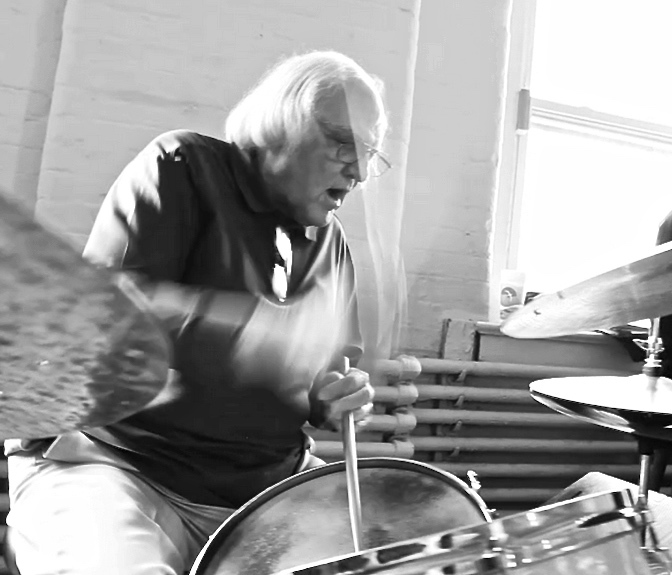 SKF NOTE: Indianapolis music teacher Bob Phillips, who John Von Ohlen mentions in this post, is, John says, “the guy who really taught me music.” Mr. Phillips and the back story to this 1985 Modern Drummer interview are explained here. Learn more about Mr. Von Ohlen’s current drumming on The Blue Wisp Big Band web site. Scott K Fish: I’ve heard many favorable comments about the Stan Kenton Clinics. What were you expected to do there? How did you feel about doing them? John Von Ohlen: Well, they were wonderful experiences. There was only one thing that might have been a detiment: Teaching should be done by someone who knows. Well, hell! We were going into all these clinics, and alot of guys in the band were just learning themselves. But we were put into teaching positions. The kids looked up to us because we were with a nationwide touring band. So you’re spouting out all this crap that is probably erroneous. I was guilty of that sometimes, but there were guys in the band who were in alot worse shape than I was and they were giving dissertations that were wrong. They were into brawn: How to play loud and nothing else. What the hell kind of clinic is that? I always stressed that drummers shouldn’t take it too seriously and should relax. Keep your physical body as relaxed as possible while you’re playing. Right away you get a better sound, and your time will probably be better because you are relaxed and free in your mind. Everytime you get a bunch of drummers together they’re so serious. They’re thinking about all of this crap they’ve got to do because of all these heavy drummers around the country. Man, some of the best moments in drumming have been the simplest little things. I like to play as complicated as the next guy, but you don’t have to do that. Your base should be a simple perspective. Harvey Mason can play complicated, but he lays down some pretty simple things. But it’s got that feel on it – so, what the hell! You don’t need to do much when you’ve got the feel. Why blow the feel for some brainy idea? In situations where a drummer will be using his or her right hand on the snare — use a less severe angle. And thank you, Joe Gaudio, for reconnecting me with John Von Ohlen. This entry was posted in SKF Blog and tagged Blue Wisp Big Band, John Von Ohlen, Modern Drummer, Scott K Fish, Stan Kenton. Bookmark the permalink. Right on Scott! Thanks for sharing. I try and stress the importance of keeping things simple in my blog and my book. I spent a lot of years over complicating the groove and it took a mature mind for me to finally get it!